The theme for this week's Mommy Moment is Haircut. A Perfect timing because my husband just cut my son's hair the other day. Sissy Rylie took a pic of EJ after his hair got cut. 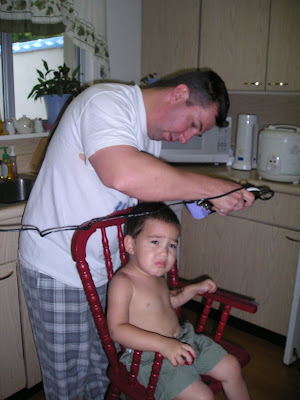 These photos were taken during EJ's first haircut. 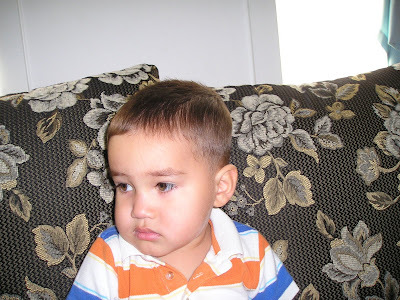 We brought him to a real barber (January 2008). He didn't like it hehehe. Here's the shot before the haircut. I have to sat in the chair lol.. After the hair cutting is done... The barber did not charge us because she said that first hair cut is always free. Thanks! His new look after the haircut. I posted my entry for our princess here.